Review in a Nutshell: The Emerald Sea was a fun, addicting read for those who are returning to the world of the Glittering Court and those who have yet to discover it. 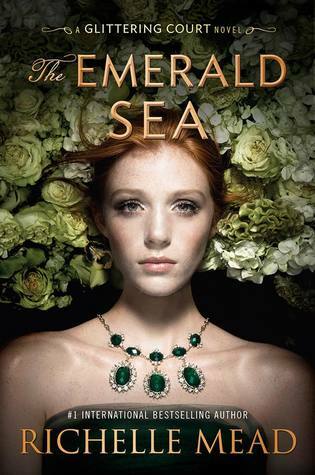 The Emerald Sea follows Tamsin Wright, a girl from a poor family with a big secret. She’s joined the Glittering Court to be taught the ways of the nobility and sail across the ocean to the new land, where she can find a wealthy husband. However, her voyage doesn’t go as planned and she and 20 other Glittering Court girls are left stranded, far away from their initial destination. With the help of a rugged trader, Jago, and a junior minister of a puritanical community, Gideon, Tamsin must figure out how to salvage her plan in time. The setting and world of the Glittering Court series are pretty simple, and nothing very unique. There is Osfro (basically England), the colonies (basically the American colonies), the Heirs of Uros (basically puritans), the Balanquans (basically Native Americans) and the Icori (basically Celtic clans). The world-building itself isn’t too complicated. This book honestly feels more historical than fantasy, and the lack of a magic system makes it easy to jump right into the universe. The Emerald Sea does explore more aspects of the world that had only been briefly alluded to in previous books, which was interesting. Richelle Mead’s writing style is always fun. Her sense of humor always makes me smile, and I really enjoy the dialogue between the characters in her books. The pacing felt a little off at times, mostly due to major sections of previous books in this series being brushed aside because it wasn’t as relevant to Tamsin’s story. However, it is definitely better than that of the first book, The Glittering Court. The Glittering Court (the place) takes up very little of this book, and the action starts much faster, with plenty of thrills along the way. The plot may not have been as action-packed as in The Midnight Jewel, but it still held its own and kept me constantly wanting to read more. In comparison to the other books in this series, I’m not sure if The Emerald Sea is equal or just below The Midnight Jewel, with The Glittering Court being my least favorite. If you haven’t read any of the books in this series, I would recommend reading them first, but you don’t have to. But I will say, this book does spoil the events of book 1. And if you’ve read the previous two books and are worried you know everything that will happen in this book, don’t be. This book has plenty of twists to keep it interesting and surprising. The characters in this book are all interesting. I honestly didn’t expect to like Tamsin as much as I did. I thought she was okay in the previous books, but this book completely changed my opinion of her. Her character arc was great, and I loved the version of her I saw in this book. Jago was another interesting character who wasn’t what I expected. After reading the synopsis, and after rereading the previous books to try to figure out what exactly will happen in Tamsin’s story, I wasn’t expecting Jago to be as lighthearted and funny as he was. I also loved Gideon in this book, and how Richelle Mead 100% knew what she was doing when she introduced him in The Glittering Court(view spoiler). I also loved the relationships in this book, both romantic and platonic. I was in a major reading slump before jumping into this book and this was exactly what I needed. It was cute, fun, and had me completely hooked. The Emerald Sea is an entertaining, witty read with a cute romance and a thrilling plot.